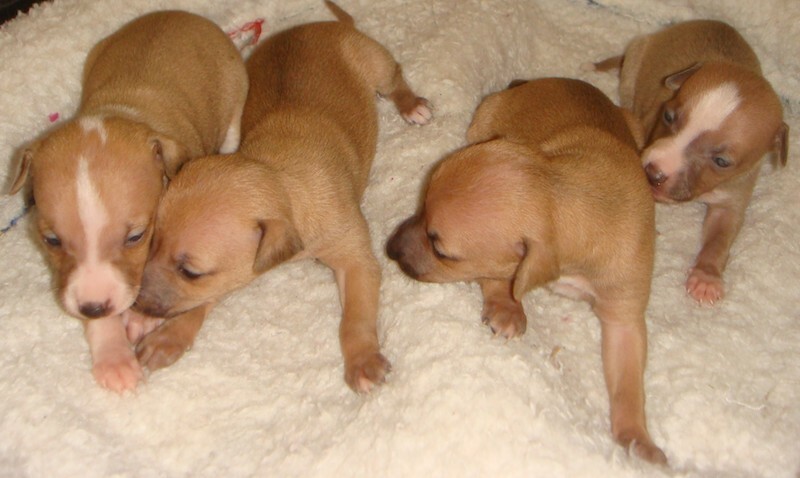 Italian Greyhound is an ancient breed of dog whose ancestors are believed to have originated in Egypt. 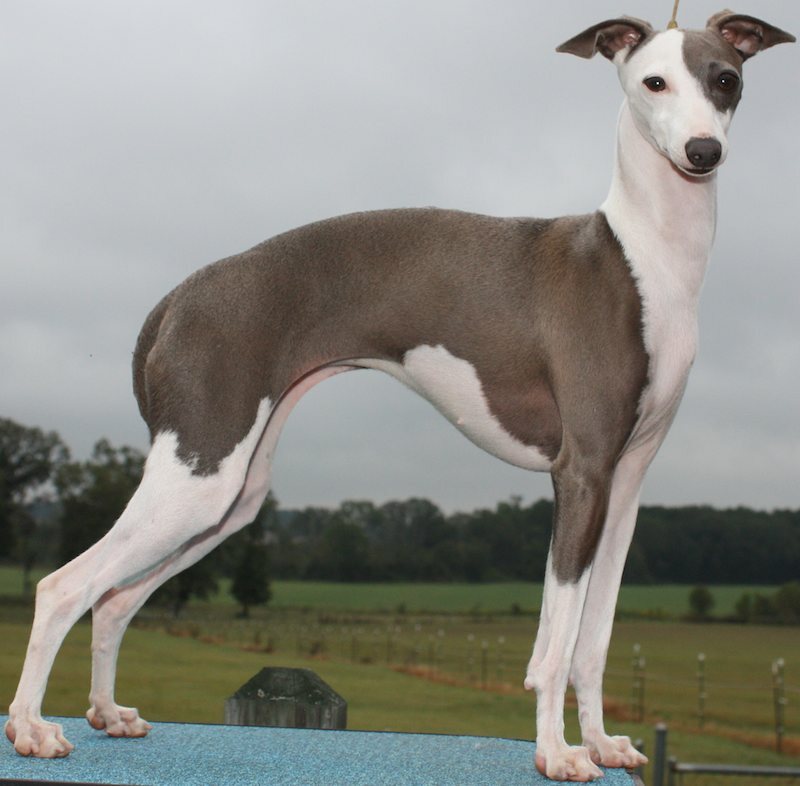 Through selection in Italy, a more refined type was developed and its immense popularity in Italy led to this developed breed acquiring the name Italian Greyhound. Image: Miss Mackenzie’s Italian Greyhounds Stellio and Vino – 1867. K9 Research indicates that the breed was originally used for the pursuit of small game, but as depicted in European art in the Renaissance period, its role seems to have been as much that of a small companion to the nobility. 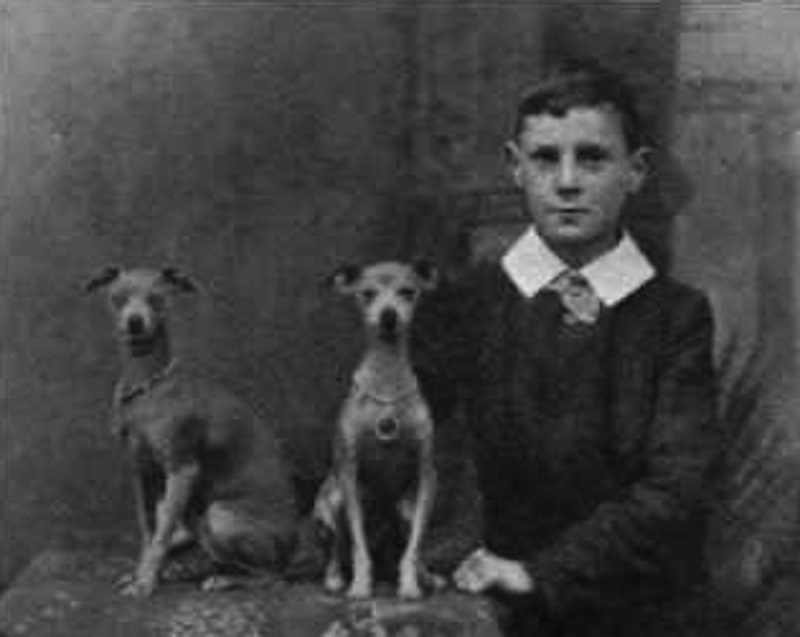 The Italian Greyhound breed was miniaturised in the 1800s and since that time has been too small for hunting purposes. Although it has retained some of the sporting characteristics, the Italian Greyhound today it is kept as a toy dog or companion. 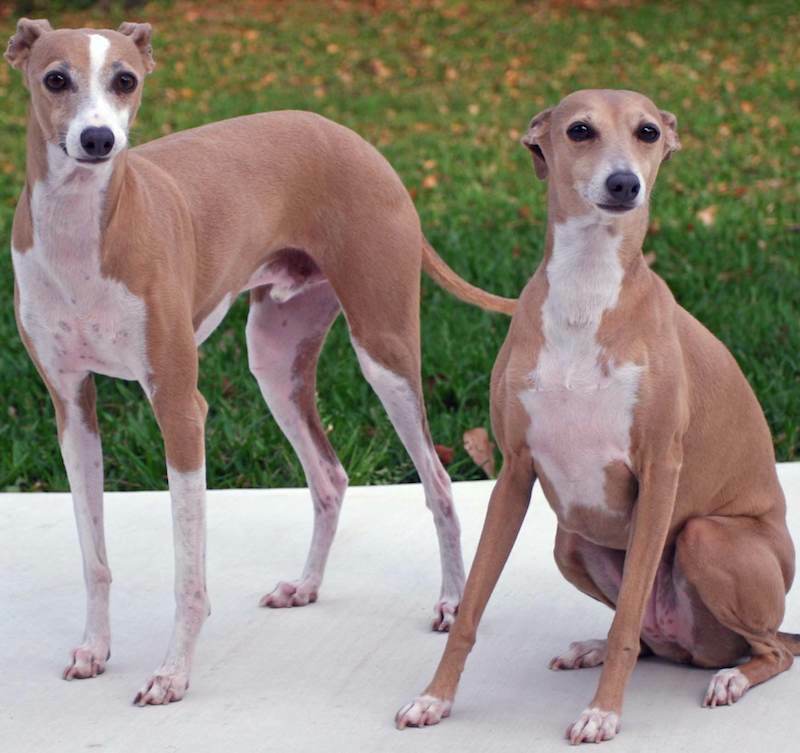 General Appearance: The Italian Greyhound is similar in appearance to the Greyhound but very much smaller and more slender in all proportions. Its appearance is one of supreme elegance and grace. The body of the Italian Greyhound fits into a square. Image: Comparison between a Greyhound, Whippet and an Italian Greyhound. 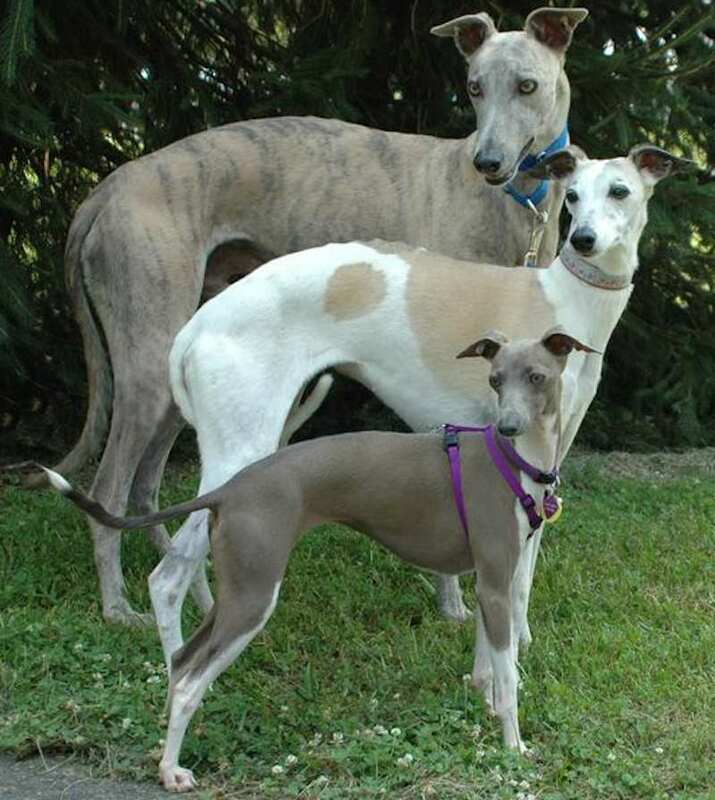 Greyhound is the largest, Whippet is medium and the Italian Greyhound is the smallest of these three similar looking sight hounds. 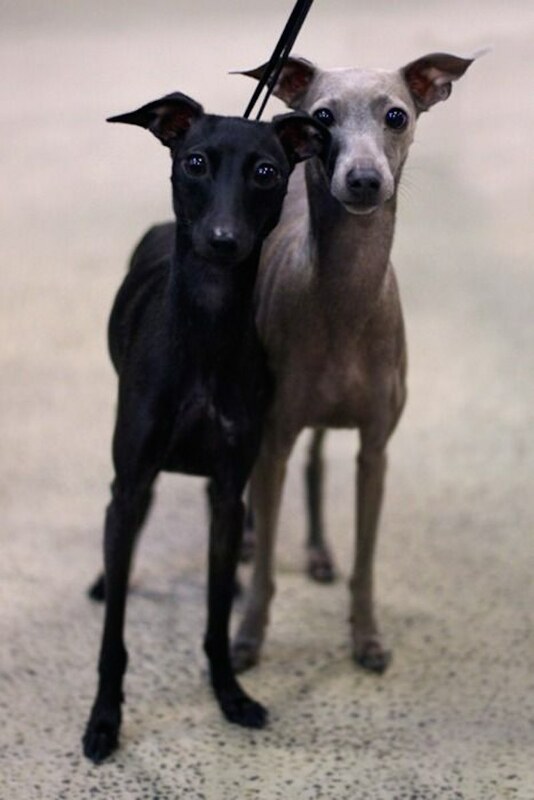 Italian Greyhound Temperament: It is intelligent, agile and vivacious. It has a very affectionate and sensitive nature and is sometimes reserved with strangers. Size: Height 13-15 inches (33-38 cm). Any deviation from these limits must be considered a serious fault. Coat: Very short, close, of fine texture, silky to the touch, glossy like satin. The skin is fine and supple. Colour: White, cream, fawn, blue, grey, black, red, chocolate, bronze, blue/fawn, red/fawn. Any shade of these colours, solid or with white markings or white with coloured markings is acceptable. A mask is permissible. Brindle colour is disqualified. Head: Long and narrow. When viewed from the side, the planes of the skull and muzzle are parallel to each other and of approximately equal length with a slight, gently sloping stop. The general appearance is one of a finely chiseled sculpture. (a) Skull Long, narrow in width, top almost flat, sides slightly rounded. (b) Muzzle Long and fine, tapering to the nose but with no suggestion of snippiness; topline flat. Portion beneath the eyes well chiseled. (c) Nose Dark in colour. The nose in profile is in the same line with the top of the muzzle and projects ahead of the muzzle. A lightly or partially pigmented nose is a serious fault. (d) Mouth Jaws are strong with no suggestion of snippiness. Teeth are even, complete in number with a scissors bite. Lips are thin and close fitting, well pigmented and dark. An undershot or overshot mouth is a serious fault. (e) Eyes Rather large, more round than oval shaped; bright and full of expression; dark, ranging in colour from medium-brown to black, in keeping with the colour of the coat. Self-coloured eyes are acceptable in a blue dog, although dark eyes are always preferred for any colour. Eyes should be neither protruding nor deep-set. Pigment of eye rims is dark. Light eyes are a fault. Partly pigmented eye rims are a serious fault. (f) Ears Rose shaped, small and of fine texture with thin cartilage; set high and well back on skull. The inner base attachment of the ear should terminate perpendicular to the middle of the upper eye rim. In the relaxed position, the ears are carried folded back over the nape of the neck, revealing the auricle, with the skull between the ears appearing slightly rounded. When alerted, the lower half of the ear is raised upwards, and the upper half is folded and carried horizontally above the topline of the skull, giving a flat-skulled appearance between the ears. Erect or prick ears are a serious fault. Button ears are a serious fault. Neck: Long, slender, gracefully arched. Its length from base of skull to the withers is approximately the same as the length of head. Its top line shows a distinct arch from the crest and joins the withers rather abruptly. The skin is close fitting with no throatiness. Forequarters: (a) Shoulders The shoulder blade (scapula) is long, well angulated, well muscled but not overly prominent. (b) Withers The region of the withers should be well muscled. The point of the withers should be distinct when the dog is viewed in profile but not overly prominent. (c) Upper arm The scapula-humeral angle is obtuse; the direction of the angle is parallel to the central plane of the body. (d) Lower arm Legs are set well under the shoulders, light boned, straight and vertical as seen from the front or in profile; elbows are turned neither in nor out. The height of the elbows from the ground is slightly more than the distance from elbows to withers. (e) Pasterns Strong, slightly bent, fine bone. Body: The length of the body, measured from the point of the shoulder to the point of the buttocks, should not exceed the height of the withers. The body should be covered with firm, flat, well toned muscles. The tips of the hipbones and a shadow of the rib cage can be visible. (a) Topline: The topline is level, up to the start of the lumbar vertebrae (the 11th vertebra) where the arch of the loin begins in a gentle curve. The curve continues steeply down over the croup. There should be no abrupt break in the curve where it drops over the croup; rather it should be a smooth continuation of the curve, which starts over the loin. A wheel back, a roach back, or a flat topline from the start of the loin to the tailset are serious faults. (b) Chest Deep and narrow; slight spring of rib. When viewed from the side, the ribs extend well back and the brisket should be at elbow level. When viewed from the front, the chest of a mature dog should be narrow but visible between the front legs. Wide in front, barrel-chested, slab-sided, or shallow in chest are faults. (c) Loin Short coupled, strong. (d) Croup Drops smoothly from the horizontal, giving a steep angle to the slope but blending harmoniously with the curve of the loin in a smooth arc, thus giving a low set to the tail and contributing to a curved silhouette. (e) Abdomen Should show a very definite tuck up at the flanks. Hindquarters: In a natural stance, the hindquarters should give the impression of a small running hound and should exhibit good muscle tone. When viewed from the rear, the legs should be straight and parallel. (a) Hipbone The tip of the hipbone can be visible but the dog should not appear emaciated. (b)Upper Thigh Long, lean, well muscled but not overdeveloped. (c) Lower Thigh Approximately the same length as the upper thigh, fine-boned; the groove between the bone and the tendon above the hock very sloped with the tendon plainly visible, and the skin of the groove almost transparent. (d)Hocks Well let down. When viewed from the rear, the hocks and pasterns should turn neither in nor out. When viewed from the side, the front line of the pastern should be on a vertical line from the point of buttocks to the ground. Cow hocks and sickle hocks are serious faults. (e) Stifle bend Well bent, showing good angulation. The stifle joint should be plainly visible and there should be considerable angulation between the stifle joint and the pelvis, and between the stifle joint and the hock. The angle formed by the upper and lower thigh is approximately the same as, and balanced with, the angle formed by the shoulder blade and upper arm of the forequarters. Feet: Hare feet, turning neither in nor out. The nails are preferably dark in colour or in keeping with the colour of the coat. They should not be cut to a short stub but should have sufficient length to give traction when running. Hind feet should be turned neither in nor out. The hind feet have toes more arched to give power to the propulsion exerted by the hind legs but with no suggestion of a cat foot. Cat feet and flat feet are serious faults. Tail: Long, fine boned, covered with extremely short hair, set low, carried low, and tapering to the tip. The first half is straight and the second half is curved. In a natural stance, the tip of the tail should reach, or extend slightly beyond, the hock. A happy wagging tail is often carried out and slightly up and this should not be penalized. A ringtail, a tail carried up and over the topline, or the bottom half of tail straight as opposed to curved, are faults. Gait: High stepping and free. 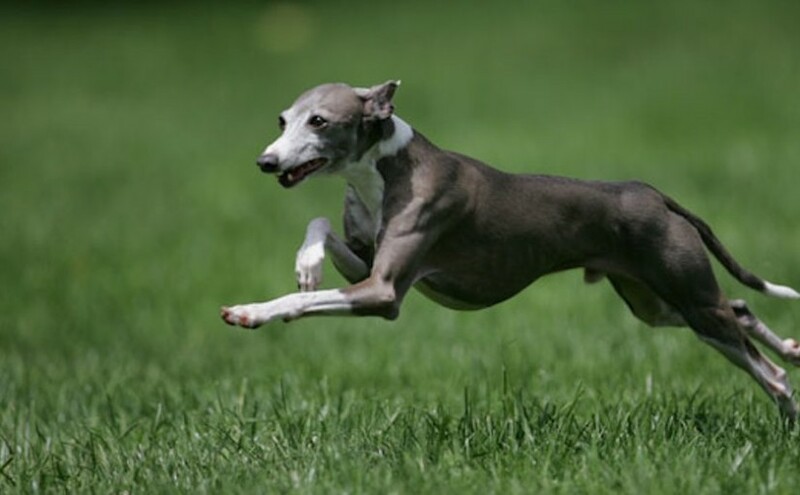 The gait of the Italian Greyhound is its most distinctive feature. The foreleg is lifted almost parallel to the ground in a fluid forward-reaching movement with good flexion or bend of the wrist joint. There is a corresponding movement of the rear leg with good propulsion. Movement should be in a straight line with no crossing over in front or rear. Action should never be choppy but should portray an elegant smoothness. Above all, movement should be sound. A hackneyed gait with exaggerated lift, or a shuffling gait with insufficient lift, are serious faults. Disqualifications: Tan points such as those of the Manchester Terrier. Brindle.